Here is the thing about veggie burgers — I found that once you bite into them, they are often mushy, or they tend to fall apart or even worse they are cardboard-like. Even some of the good ones are more akin to a fritter than a burger and all miss that juicy burger texture. These Sun-Dried Tomato and Chickpea Burgers are different. They consist of a base of mashed chickpeas and breadcrumbs and are flavored with sun-dried tomatoes and plenty of fresh basil. They are a little more crumble than my black bean veggie burgers, this is because I wanted to keep them vegan so I omitted the egg that I usually add to veggie burger to help hold them together. They still hold their shape well though and don’t fall apart in the oven like plenty of other veggie burgers I’ve tried. 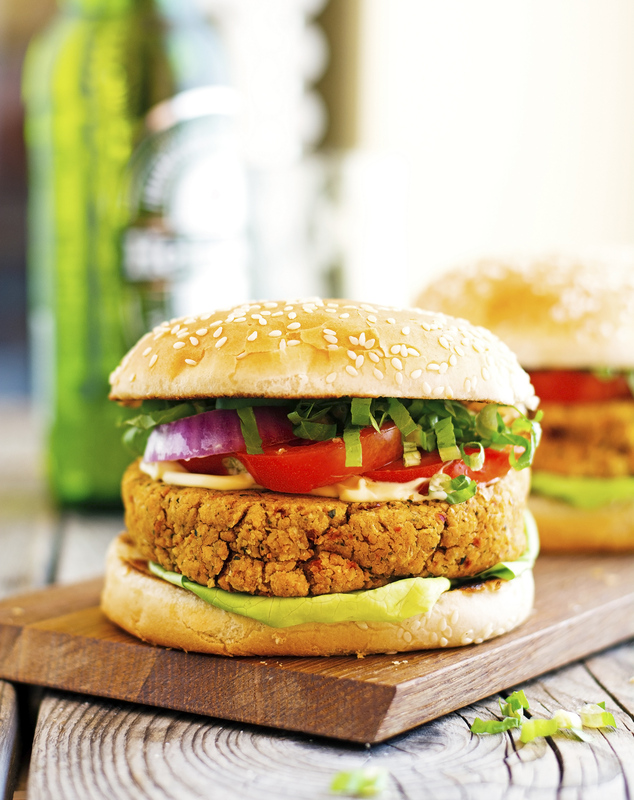 They might seem a bit on the wet side at first, but once in the oven, the chickpeas absorb all the extra moisture while cooking and the burgers firm up beautifully. 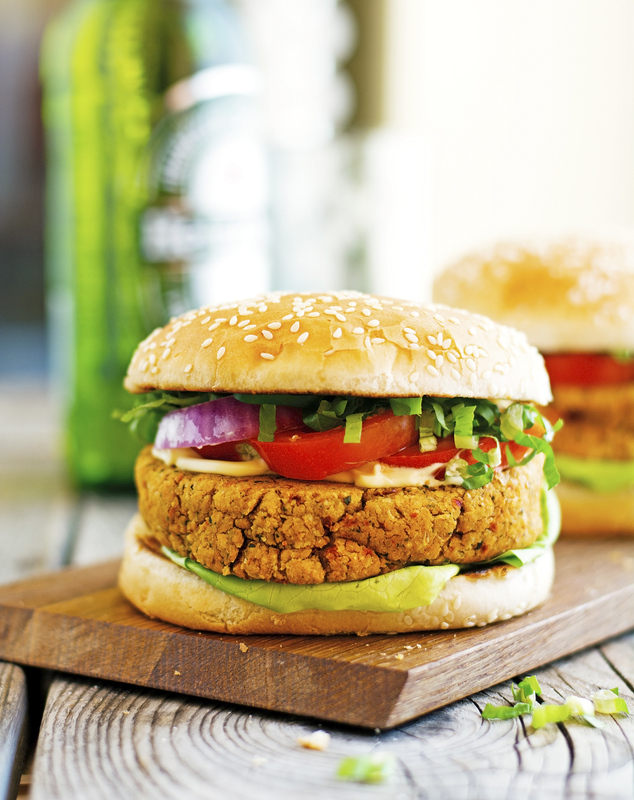 Packed with flavor, these vegan burgers are healthy and seriously satisfying. They taste like summer thanks to the sun-dried tomatoes and the fresh basil: So delicious! What’s more? Oh yes, you can make a big batch, and then freeze them individually for some other night you are short on time. All in all, just perfect. 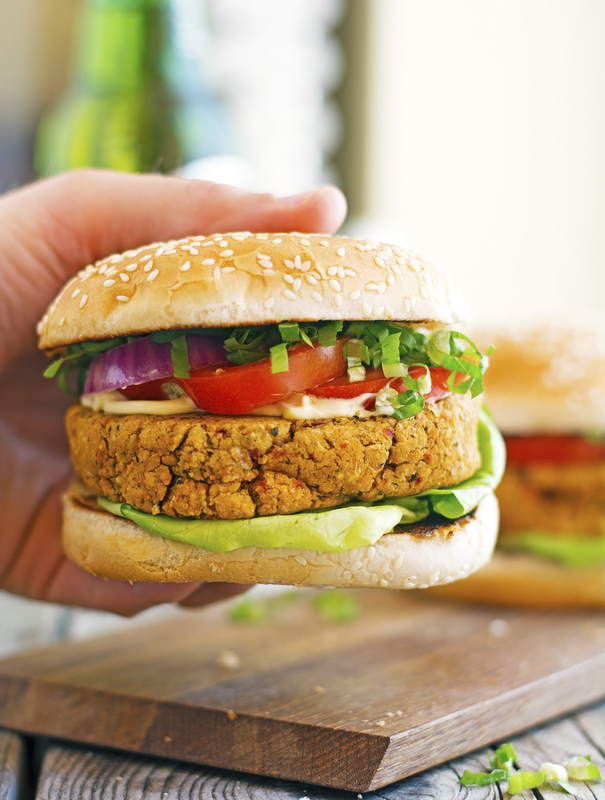 (Vegan) Sun-Dried Tomato and Chickpea Burgers Print this recipe! Place all ingredients (except for the oil) in the bowl of a food processor. Pulse until the texture looks like a fine meal. You might need to stop the food processor and scrape the sides of the bowl a couple of times. Transfer the mixture to a bowl, add oil, give a good stir, cover, and refrigerate for at least 30 minutes. When ready to cook, preheat oven to 375°F (190°C) and place a rack in the middle. Lightly grease a baking sheet and set aside. Place patties onto the prepared baking sheet and brush each side with a bit of oil. Bake for about 20 to 25 minutes, or until golden — flipping the burgers halfway through. Alternatively you can pan-fry the burgers. Heat one tablespoon of oil in a large skillet over medium-high heat, add patties and cook on each side for about 5 minutes, until golden-brown. Serve on your favorite bun, with your favorite toppings. One patty yields 193 calories, 7 grams of fat, 24 grams of carbs, and 8 grams of protein.